Volume 6 of Walt Disney's Fun-To-Learn Library, published by Bantam in 1983, was titled Real Life Monsters. In it, Mickey takes Goofy on a globe-trotting, time-traveling trip to find well, real life monsters. This mainly means "reptiles." No illustrators or writers were credited. Through the magic of Disney, Mickey takes Goofy back in time to check out some dinosaurs. It isn't long before Goofy witnesses something that will surely scar him, robbing him of the innocence that makes up such a big part of his bumbling charm. Mickey, hardened to the reality of nature's brutality, watches the slaughter as Goofy turns away in a vain attempt to erase the horror from his memory. It is futile, Goofy. You will never be the same. 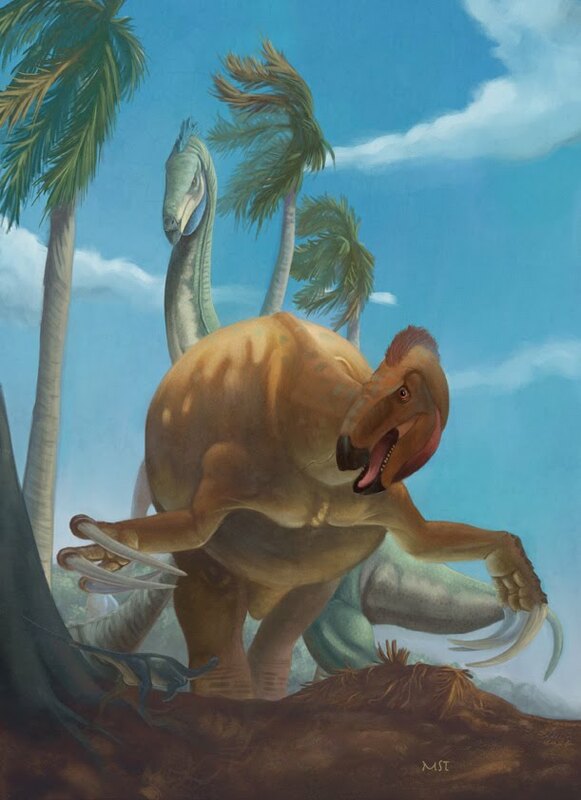 Yes, Goofy, sauropods were the ultimate moveable feast, spending their lives dimly dreading the moment when some bored theropod decided he was a bit peckish, and might enjoy gnawing on a sauropod neck while it groaned in half-interested protest. Damn, I love the expression on bronto's face there. "Aggghhh, that's my neck, moron!" Mickey might be forgiven if he at least gave Goofy a sound education. But alas, he commits that most basic of errors, calling any big old dead reptilian thing a dinosaur. Maybe he doesn't explicitly call Dimetrodon a dinosaur, but what else is poor Goofy supposed to think? It's included with the dinosaurs, and Mickey makes no effort to explain what it really is. So shame on you, Mickey. The idea that the sail was used to help Dimetrodon "keep its balance in the swampy land where it walked" might be the dumbest hypothesis I've ever heard. If anything, I imagine it would make balancing harder... oh balls, I've fallen into Mickey's little trap. I'm not going to debate him. He'll just Gish gallop me and I'll never finish this post. So here's a pretty blue Stegosaurus. I'm out. So, apparently Playmobil released a dinosaur series in 2008. I had no idea, and I have to admit: they're durned cute. If you're into expensive toys, check 'em out here. All images by TimSpfd, via flickr. Thus far, North America has not produced a wealth of toothed Cretaceous pterosaurs. One was discovered sixteen years ago: Coloborhynchus wadleighi from the mid-Cretaceous of Texas. Now the total has been doubled with the discovery of the slightly later Aetodactylus halli, also hailing from the Lone Star State. It was discovered by fossil hunter Lance Hall, then studied and described by paleontologist Timothy S. Myers of Southern Methodist University. Myers has published his description in the Journal of Vertebrate Paleontology. Like so many pterosaur fossils, the remains of Aetodactylus aren't exactly complete. All Myers had to work with was a fifteen-inch lower jaw, but it differs enough from similar pterosaurs to warrant the designation of a new genus. Myers classifies Aetodactylus as one of the last known ornithocheirids, a family of toothed pterosaurs. Assuming that this classification is borne out as other paleontologists weight in, and that the jaw represents a full-grown specimen, Aetodactylus would have been one of the smaller members of the family, with an estimated wingspan of nine feet. While not all pterosaurs fit the stereotype of being soaring fish-eaters, Aetodactylus fits the lifestyle nicely. The fine sandstone in which this jaw was found was at one time the sediment of a shallow, abundant coastal area, and the rock around the jaw was littered with bits of fish bones. And the fifty-four teeth studding the lower jaw would have been perfect for snaring a tasty seafood dinner. More: Discovery, Science Daily, Southern Methodist University. UPDATE: Foxnews.com just dropped a whole bucket of fail on this puppy, with a story headlined New Toothy, Flying Dino Discovered in Texas. They must have deemed fact-checking optional for this sloppy regurgitation of the SMU press release. Aetodactylus is called a dinosaur four times in the story, all within passages added to link together quotes from the press release. Fair, balanced, and frickin' lazy! UPDATE 2: Edited to reflect debate over exactly how Aetodactylus fits in with other pterosaurs taxonomically. The Denver Museum of Nature and Science ran this ad, featuring a gorgeously animated ice-skating sauropod, a couple winters ago. Photo by BruceandLetty, via flickr. In the old days, you might read one or two articles about a big project at a national park. Now, you can follow everything in real time. For instance, Dinosaur National Monument is currently overhauling its Quarry Visitor Center. To put a finer point on it, it's being completely replaced. Construction began last month, and the new visitor center should be complete by fall of 2011. But interested parties don't have to rely on the fickle decision-makers of the print media to learn more. These days, you can follow news about the project and the park in general at Twitter and Facebook. The park service also has a blog at the DML site. For more in-depth information, check out DNM paleontologist Dan Chure's blog chronicling the process. He gets into the complicated business of relocating the site's fossil collection - including an utterly beautiful Allosaurus fragilis skull - and protecting the monument's crown jewel: the wall of Jurassic sandstone housing an amazing array of dinosaurs and other critters. While the wall isn't available to visitors during this painstaking process, there is no reason to keep away from the monument until its new house is built. This year, entrance fees have been waived to the park and to the temporary visitor center, so there's no reason to avoid Dinosaur National Monument, which contains a landscape that is spectacular in its own right. 1968 postcard of the quarry wall, from Baltimore Bob, via flickr. When you look at the quarry wall, you're looking at the remains of an ecosystem from the Morrison Formation, one of the great dinosaur-bearing rock formations in the world. Apatosaurus, Barosaurus, Camarasaurus, Diplodocus, Stegosaurus, Camptosaurus, Allosaurus, and Ornitholestes are all known from sites with Morrison outcrops dating in the neighborhood of 150 million years ago. I'm going to steal Scott Sampson's comparison here. Take a denizen of the Morrison, say Stegosaurus. Then take another dinosaur from the Late Cretaceous, like Triceratops. Stegosaurus is even further removed in time from Triceratops than we are, having lived about 80 million years prior. That tacks another 25 million years onto the 65 that separate us from Triceratops. It's actually less of an anachronism to draw a human next to a Triceratops, rather than a Stegosaurus. That blows my mind every time I think about it. Coincidentally enough, the latest post at Dot Dot Dinosaur features a piece of artwork from Etsy that highlights this very fact. Check it out! 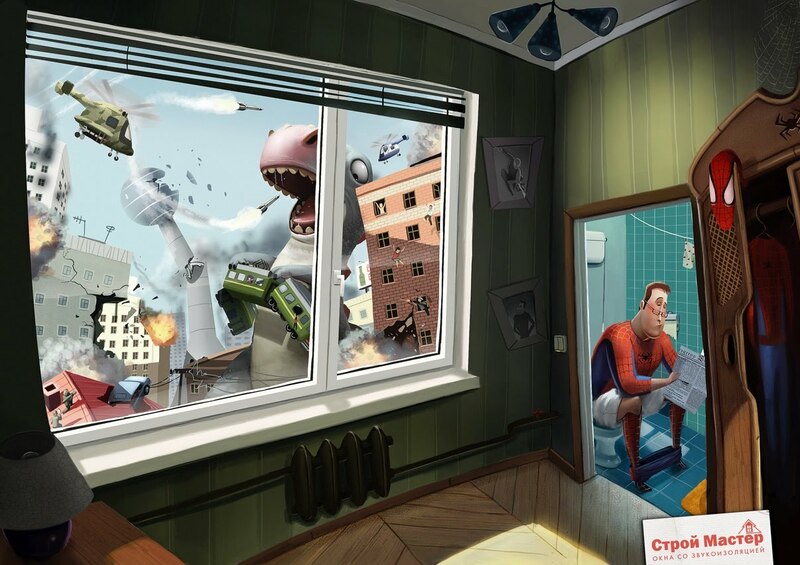 T. rex makes an appearance with Spider-Man, a superhero of some note, in this Russian advertisement for soundproof windows. Chain of hat-tips: Michael May, /Film, Coloribus. 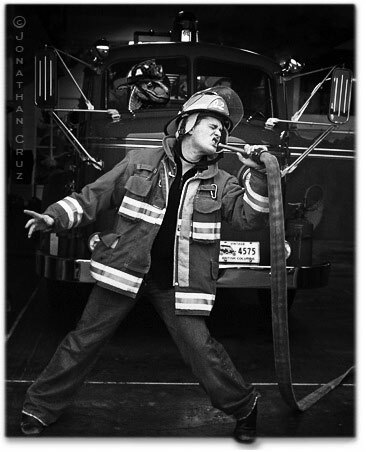 This week, the featured artist is Lewis Zacks. 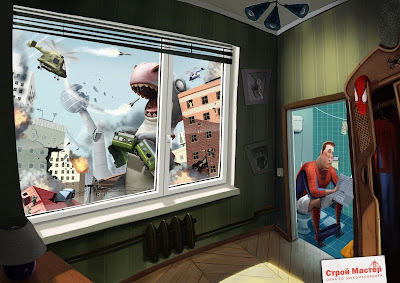 Unlike many illustrators put in the spotlight here, he has a solid web presence, including an honest-to-gosh website. However, most of what I've found has been the art he's produced later in life, after leaving the illustration game in the late sixties. In 1963, Zacks illustrated In the Time of Dinosaurs, written by veteran children's book author William Wise. It's a run-of-the-mill kid's title, hitting all of the usual basic points: dinosaurs were big, dinosaurs were dumb, dinosaurs fought each other, dinosaurs died and no one knows exactly why. It starts with a typical mistake: the first critters shown aren't dinosaurs at all, and lived millions of years apart. Additionally - andI've admitted to my still-small knowledge of paleobotany before - I'm pretty sure that tree, which looks kind of angiospermy, wouldn't have been familiar to Dimetrodon. It's not the only anachronism, either. Later, a Triceratops and Stegosaurus share a page. It seems that this book was published merely because dinosaurs are a safe gamble. The prose is pretty simple, and besides getting basic things like spelling right, not a lot of time or effort was put into the science. Zacks' illustrations seem to have been done pretty quickly, without much reference to fossils for accuracy. 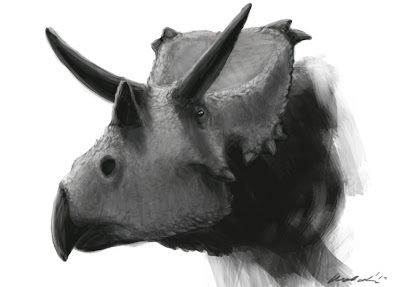 Take this Triceratops, whose beak sprouts from his face above the mouth, as if it's another horn. Yet in this next drawing, the beak is clearly part of the mouth. Note that the Tyrannosaurus with which it's fighting has three fingers; this reflects then-incomplete knowledge of T. rex forelimbs rather than disregard for anatomy. The book ends with this solitary T. rex, another common trope of kid's books. I've done quite a bit of searching, and can find no other examples of work from Zacks' illustrating career. I don't know how the dinosaurs in this book fits in with his body of work. Some of the wider views, such as that last T. rex, are pretty nice, and I love the limited color pallettes of many of these old books. The larger close-ups aren't as nice. They seem both busy and rushed. Not that I doubt the artist's skills; I'm sure many of these illustrators were working under short deadlines. Here's a recent interview with Zacks, concerning his current artistic interest in the architectural artifacts of the mid-20th Century, especially old signs. If you'd like to see more from this title, head over to the Vintage Dinosaur Art flickr group. The National Museum of Natural History, part of the Smithsonian Insititution, opens a brand new dinosaur exhibit next Wednesday, April 28. "Dinosaurs in Our Backyard" focuses especially on those dinosaurs local to the Baltimore/ Washington DC area. Photo from the Smithsonian Institution Archives, via Flickr. The fossils come from Prince George County, Maryland's Dinosaur Park, which was dedicated just last fall. To learn more about efforts to preserve important localities like Dinosaur Park - in particular a quarry that is New Jersey's only window into the Mesozoic - click here. The Baltimore Sun's report on the dedication of Dinosaur Park is here. Dinosaur Dig was an Apple IIC game. Never played it, but it looks pretty, pretty, pretty solid. That's all I got right now. My 'puter won't let me rock this bad boy. If any of y'all have better luck, let me know! It's been a while since I've gotten nit-picky with a piece of sloppy journalism. I've kind of missed it, to be honest. If you're getting paid to write this stuff, get it right. And often, following up on something that sounds a bit shady leads to some new knowledge, which is a spiffy thing. The stale old mistake of calling pterosaurs "flying dinosaurs." It's possible that the article is referring to birds, of course, but it's relatively rare for that phrase to be used in that way. It's almost always a misidentification of a pterosaur. Something called "fungasaurus." Googling the word leads to either the article itself or references to a video game character. Here's the twist. Number three is basically true. I had not heard of it, and investigating the claim has been a lot of fun. Here's what I've learned. The T. rex display at the HPM is a restoration of the Fort Peck Rex, the first specimen found that preserves a "third digit" on the hand. The Fort Peck Rex was unearthed in 1997 by a team led by J. Keith Rigby of Notre Dame University, and was also the subject of one of those messy battles over who has rights to the fossils: the property owner or science. The specimen was then subjected to years of study, and it has popped up occasionally on the Dinosaur Mailing List, where paleontologists and other dinosaur researchers engage in debate over matters mesozoic. At the 2007 meeting of the Geological Society of America, a presentation was given about the specimen by paleontologists from Fort Peck Paleontology, Inc.
Peck's Rex also provides further evidence that those widely derided arms of the T. rex didn't just flop uselessly. The left arm shows signs of having a bad muscle tear, either due to repeated stress or a struggle in which it essentially was pulled in a "tug of war" between its owner and another animal. I'd like to put forward the entirely reasonable hypothesis that it got stuck in a Mesozoic vending machine. Here's the Science Daily article about the Fort Peck Rex from 1997. Notre Dame Magazine published an interview with Rigby in 2003. Brian Switek wrote about the find at Laelaps, prior to the 2007 GSA Meeting. Looking Again at the Forelimb of Tyrannosaurus rex, a chapter by Christine Lipkin and Kenneth Carpenter in the volume Tyrannosaurus rex: The Tyrant King (Indiana University Press), is available at Google books. Here's a local PBS interview with Jacene. Or maybe you just want to own a replica of the "pinkie." Back to the really important stuff. What the hell is a fungasaurus? 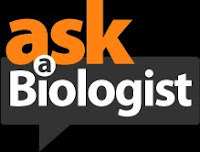 Ask a Biologist has been relaunched, and it looks fantastic. If you're unfamiliar with the site, it's pretty self-explanatory. Visitors write in with all kinds of questions and one or more biologists provide brief answers. A disclaimer on the front page makes clear that they are not there to provide answers for homework, and they often push readers to look to other sources to learn more. Here's an excerpt of the response Neil Gostling of SUNY Oswego gave to "Is it possible to clone dinosaurs?" The ideas in Jurassic Park were fun, and made a good story. However, even if you take 'biting insects' from amber (to look for blood from the last meal they ate, before becoming entombed in tree sap) there are two problems: Firstly the blood that they are eating is a meal, so it will be (in the process of being) digested, and secondly we don't have any amber with biting insects in as old as the dinosaurs (to the best of our knowledge). You don't need to be a student, either. Got a question that's burning a hole in your brain? Go on and ask a biologist. Here's a small and simple one, from a Golden Book called Animal Dictionary by Jane Werner Watson. It consists entirely of small illustrations of animals arranged under each letter of the alphabet. Illustrator Feodor Rojankovsky was, like previous VDA subject George Solonevich, a Russian immigrant who would wind up in the USA, where he spent his career illustrating children's books. 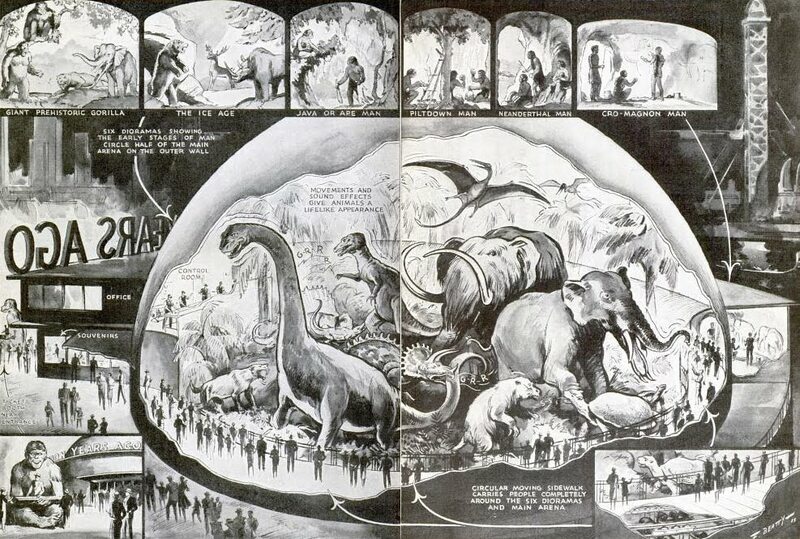 Rojankovsky's great inspiration was the natural world, and many of the books he illustrated reflected this. Biographical material is available here. More of Rojankovsky's work is featured at Full Table. And here's a post about his work from 2005 at the blog Bella Dia. And here's a post featuring his book Christmas Bear at the blog Golden Gems. Continuing this week's theme of frivolous dino-kitsch (necessitated by an unholy amount of work), I submit this piece of nondino-kitsch. I guess I'll call it pelyco-kitsch. It's my model of the Permian era's most recognizable beast, the finback pelycosaur Dimetrodon. I couldn't have been older than five or six when I got it, and I'd imagine it came from the Field Museum gift shop. My dad used to drive me up there, which I'm sure was fun for him, but it was also probably an excuse to drive his little MGB convertible on Lake Shore Drive. I love the face; it almost has a Tlingit quality to it. I also remember the set anachronistically including a club-wielding caveman, presumably for scale purposes only. But I remember the caveman being absolutely tiny. He didn't even reach the dimetrodon's knee. This is comically out of whack; he should have been about have as tall as the dimetrodon is long. The caveman was lost a long time ago, so I can't confirm this hazy memory. I have no great need for trinkets, doo-dads, knick-knacks, tchotchkes, or any other breed of small object whose sole purpose is to occupy a small space in my home. And over the last ten years or so, I've divested myself of one collection after another, from Star Wars figures to childhood drawings to my impending sell-off of those tubs full of compact discs in my basement. Once I started a cycle of periodic moves, the charm of keeping a bunch of stuff was negated by the weight of it all. The one exception is the little bits of natural history I've collected - cool river rocks, crinoid stems, shells, and the like. Whenever I run across a piece of well-done dinosaur kitsch, I'll snap it up. Something like this. He doesn't have any markings to indicate his origin, but it doesn't have any deleterious effect on his role as the silent sentinel watching over my fossil collection. I don't usually actively pursue new bits of dino-kitsch, but I'm sorely tempted by the Hagen Renaker collection of dinosaurs. Real estate is dear, and if a few square inches need to be occupied, it may as well be a well-chosen fossil or piece of mesozoic memorabilia. Here's a nifty little animated Chasmosaurus irvinensis from the Canadian Museum of Nature in Ottawa. C. irvinensis was identified in 2001, and this video was created from 3-D scans of the fossils in an effort to explore how it may have moved in life. If you're in Ottawa, you can check out the fossils and life reconstructions in the Talisman Energy Fossil Gallery, which is the best name you could ever give an exhibit hall. Also, here's a video of someone's Spore critter. I've always enjoyed hidden compartments, alcoves, secret passages behind walls, and that sort of stuff. 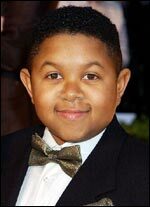 Remember the house on the sitcom Webster, starring TV's Emmanuel Lewis? The grandfather clock served as a secret door to a corridor behind the wall. I think there were other things, too. Maybe a lazy susan that connected to Webster's room via a chute? That stuff drove me nuts when I was a kid. While I have neither the time, the skill, nor the money to do something on that scale in our house, one of the features I love about it is its built-in book shelf. This has ended up housing my fossil collection and books about dinosaurs and other science topics, probably a sub-consciously chosen place for the things that are important to me. Harmony Ball is a company that makes all sorts of odd little gift items, and their Pot Bellys line of miniature figurines are pretty cool - each has a secret compartment. 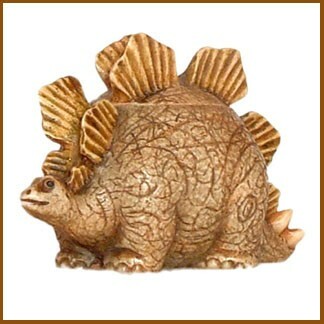 They've made a dinosaur series of Pot Bellys, and though the company's site only lists the non-dinosaur but still cool Dimetrodon, I found the complete set of six for sale at this site. Here's the Stegosaurus. It's neat. Earlier this week, I referred to the old illustrator's trope of sticking dinosaurs in front of volcanos at every opportunity. So, here's one that does just that. I really, really like this one. It was drawn by Tom Dunnington for the Pacific Shores volume of a series called "Enchantment of America," published by Childrens Press of Chicago. Before spending some time on the native peoples of the Pacific coast, the book runs through a bit of prehistory, thankfully making a brief stop in the Mesozoic. That big old theropod (who am I kidding, it's a T. rex), like the Allosaurus from a few weeks ago, has a definite canine character to him. I love that he seems genuinely entertained by the volcanos erupting on the horizon, sitting up like a dog waiting for a treat. Dunnington is, unfortunately, not well-represented on the net. Google searches turn up plenty of books crediting him, and this site indicates that he may still be active. It's a bummer when I can't find much on these illustrators; something in me wants to know as much as possible. In an effort to inspire others to help save the work of these generally obscure men and women, I started a Flickr group dedicated solely to old dinosaur illustrations. Fittingly enough, it's called Vintage Dinosaur Art. 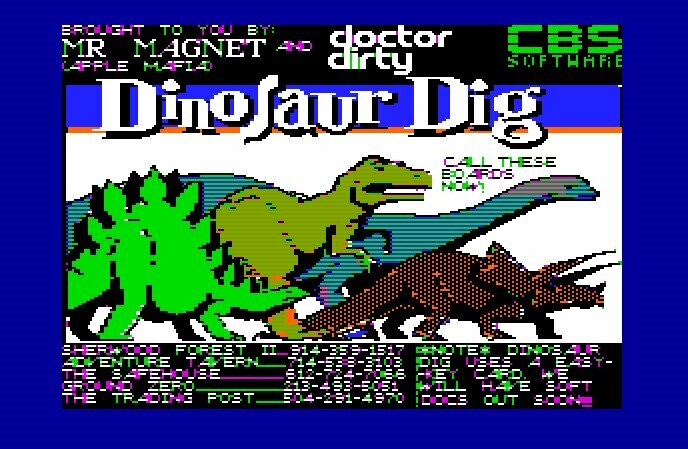 If you've got some old science books with dinosaur art in them, this is a great opportunity to scan it and share the artists' work with the world. There are plenty of groups dedicated to old illustrators, and plenty dedicated to dinosaur images in general. This combines the two. At his website Drip.de, David Maas features an interview with Bruce Woollatt. As his latest piece of Mesozoic sculpture, Bruce is hard at work on an incredible 1:10 scale skeletal reconstruction of Tyrannosaurus rex. As you can tell below, the craftsmanship is stunning. Coolest of all is that it's going to be poseable. Check out the interview for good, in depth information on the project. And this previous interview for the Open Dinosaur Project sheds some more light on the artist. Chasmosaurus by Matt Van Rooijen, used with his permission. The latest LITC interview subject is Matt Van Rooijen, an Australian artist introduced to the paleoart world by Dave Hone of the Institute of Vertebrate Paleontology and Paleoanthropology in Beijing. In the last couple months, Matt's reconstructions of Linheraptor and Xixianykus, two new Chinese theropods, were published with their initial descriptions. Readers of this blog have probably noticed my fascination with the intersection of art and science; paleontology has an especially deep relationship with the arts. Paleoart well done communicates science in a vital way, and serves as an entry point to further knowledge. Matt's pieces exemplify this, and as I've previously noted, I'm happy that his unique voice has been added to the mix. Please be sure to read his blog, Optimistic Painting, as well as Hone's Archosaur Musings, which contains plenty of information about these recent discoveries. Onward, then. You write about a pretty diverse range of projects on your blog. Can you tell us a bit about your artistic background? Studied Fine Art at Uni in South Australia, which was pretty diverse covering traditional painting, drawing, sculpture. Fine Art is (or was) all about "concept" and "interpretation," so I didn't quite fit in because I liked what they described as "Surrealism," which was really fantasy/sci-fi illustration. Then I discovered the Commodore 64 computers in the film department, running 'Deluxe Paint 4'. They didn't really know what to do with them, they didn't teach us how to use software or anything (it was the late 80's/early 90's). There's an even longer back story here, but suffice to say it lead to me ditching most of the other classes and making animation pixel by pixel. That lead to a career in animation, with a smattering of illustration and concept design thrown in. I've worked medical animation, online realities, short film, and animation for TV. Illustration has been a recent revival for me, so I haven't done much and compared to a lot of the talent out there I'm pretty rough 'round the edges. Did you have a favorite museum when you were growing up, or a similar place where your love of science began? Unfortunately I grew up in country South Australia, closest museum was in Adelaide, 8hrs away by car. They did have a cool mount of Allosaurus and a tyrannosaur skull cast, as well as a cast of the Winton Stampede dinosaur tracks. I was made painfully aware of the lack of Australian dinosaurs looking at the case of tiny fragmentary bits that, until that time were the only discoveries. How big a deal were the Wintonotitan, Australovenator, and Diamantinasaurus in Australia? Announcing three big dinosaurs at the same time is pretty significant. The media did pick it up well, with pretty good coverage. There was also a great 3D animated reconstruction of Australovenator on TV by Travis Tischler, who also did their 2D stills. Some nice stuff of him working in Z-Brush, the tools for reconstruction are marching along with technology! I was in the middle of a real life painting of some polar allosaurs taking on a muttaburrasaur. For years we'd had this tantalising astragalus (an ankle bone - ed.) which had been identified as [coming from] a 'dwarf' allosaur, so it was great to have such a complete find which described a more individual animal. Of course, now I have to change the painting. Has natural history always been a big part of your art? Thinking back it was there all the way. Much of school was spent making drawings of things that all had a suspiciously William Stout slant to them. My final painting at Uni was a 10 foot tall mural with the scientific name for humans interspersed with painted developmental stages of the human foetus ending in a human skull. I saw science as a way to bring perspective to our place in the world. I also did a painting with a bag lady riding a T. rex through city streets. One of the first things I animated was a Hypsilophodon running (I think I was supposed to be animating a car at the time). Both of your Chinese dinosaur paintings are quite striking, and I love that they both capture a moment in an animal's life. Was it an early decision to depict moments of action rather than a "posed" creature? Thanks! Yeah, both Dave Hone and I were keen to depict living animals. I looked around at wildlife photography a lot, living animals are the best place to start to get a feel for what seems natural. Linheraptor was going to be a bit more static, but I'd had an image of a lion locking onto it's prey from an old National Geographic or documentary from years ago in my head. What had struck me was the way a predator's body can be going berserk chasing something but the head would be completely focussed and level, like it was on a gimbal. Dave liked the sketch. The thing I wanted not to do was have "side on" dinosaurs, which seem really common since artists like Greg Paul have been giving us such excellent skeletal reconstructions. The alvarezsaurs are a bit more obscure than dromaeosaurs. Were you very familiar with the group when you started on Xixianykus? I knew about the alvarezsaurs for quite a while, I try and keep track of new natural history discoveries and they stuck out because they were quite bizarre. There were some great photos and reconstructions around. Did the processes for each of these first two pieces for the IVPP differ greatly? Not really. I was given the paper (resulting in anatomy overload, I thought I had a reasonable grasp of anatomy, palaeontologists work at a much higher resolution) then had to research and ask lots of questions about anatomy, habitat etc. I guess the main difference was Linheraptor was "exquisitely" preserved while Xixianykus looked like a crushed roast chicken. One of the things I've enjoyed as I've read more scientific papers are new, strange words for my vocabulary. Do you have any favorite words from the scientific jargon of anatomy? Not really, but my 4 year old son has started measuring distances in "Klonkimeats." Is the process much different, working with scientists rather than anyone else who might commission a piece? Scientists, or at least Dave Hone, seemed to know what they're after a bit more clearly than other clients I've worked with. Revisions come about more because of accuracy issues or lack of (my) research rather than aesthetic considerations. For my process I wanted to know if there were specific features they wanted to depict, whether it be anatomical, physiological or behavioural. Linheraptor went from having a couple of months to complete to a week as the paper was unexpectedly accepted early! So while that certainly wasn't the fault of the people who'd commissioned the piece, it seems like pretty standard stuff in the world of commercial art and animation! Would you like to branch out from dinosaurs in future scientific reconstructions? What other ancient creatures interest you artistically? I could give you a list but instead I'll just say: all of them. Seriously though, I think I'm a science junkie. I love the thrill of discovery. What paleoartists do you admire most? William Stout, Greg Paul, James Gurney. William Stout was probably the artistic influence on me growing up. His animals have personality and vigor, even when they're just standing still. I still love his stuff. He depicts things in such a bold way. Greg Paul really started people thinking about actually fitting the bones in the flesh; reconstruction became a more serious business. His reconstructions are all about accuracy and anatomy. Paul's style is reproduced so much that I get a bit tired of seeing the knock offs, but then I look at his original stuff and it's just great. I suspect James Gurney isn't taken all that seriously in paleoart circles? That's just a guess, as he's so well know for 'fantasy' portrayal of dinosaurs, but the man has such fantastic painting chops, and his animals live and breathe even if they're not portrayed behaving accurately. There's so many people out there doing great things besides, your Luis Reys and Raul D. Martins are just fantastic. Dinosaurs are a pretty diverse group of animals, but from an artist's point of view, do they seem to have some inherent quality that makes them so interesting? I guess what I'm getting at is, what makes them so fun to stare at? They're quite grandiose as a group of animals, like nature putting on a show. "The biggest! The meanest! The scariest!" The idea that we shared the same world with these incredible, but quite scary creatures, is also appealing. Especially from the safety of 65 million years away. Last, and maybe most important is the mystery. It seems every day we discover more, but we're likely never to discover everything about dinosaurs. So everyone has a take, or an interpretation. That said, that they've deduced colours for some species simply blew my mind. It was something that every book I ever read, since I was a child, said would never happen. 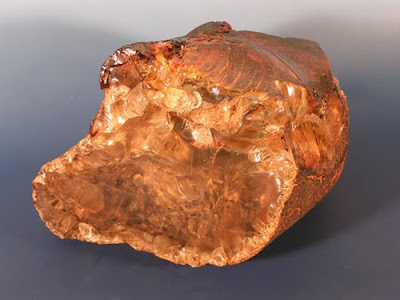 This is really neat: the American Museum of Natural History reports the discovery of a nice chunk of Cretaceous amber from Ethiopia. While pieces of the translucent golden fossilized tree resin are well known from other parts of the world, this is the first significant piece from Cretaceous Africa. It dates to about 95 million years old, at which point Africa was an island continent separated from South America by a narrow sea. The discovery is presented in the latest issue of the Proceedings of the National Academy of Sciences. Resin is the sticky stuff that gets all over my hands when I gather fallen pine limbs for backyard campfires. You're probably familiar with its ability to trap insects and other organic material; it played a key role in that Spielberg movie. You know the one. It was an adaptation of a novel. Not Minority Report. Chemical analysis reveals that the resin may be derived from a flowering tree, or angiosperm, similar to members of a living group related to legumes. The Cretaceous was the period when angiosperms really diversified, and many of the lines that wound up producing today's familiar flowers, trees, and fruits and vegetables popped up. If this resin was from such a tree, it would be great, but it may alternatively be from a previously unknown kind of conifer. Such a dense piece of an ancient ecosystem contains a wealth of information, so it is being examined by scientists from more than a dozen institutions around the world. So far, they've turned up 30 insects and spiders, as well as plant material, fungi, and bacteria. It's like sending a robotic probe back in time and having it bring back a terrarium's worth of critters to study. As pretty as it is, this hunk of fossil resin probably won't make as big of a splash as, say, a big theropod. But what it reveals about the ecosystem in which the dinosaurs of ancient Ethopia lived is arguably of much greater value than the skeleton of one creature. While big dinosaurs amp up the imagination like a shot of adrenaline, pondering the complicated interactions of every member of the ecosystem gives a more sustained rush, a point Scott Sampson makes very nicely in Dinosaur Odyssey. It used to be common to plop dinosaurs into Mordor-like wastelands of fuming volcanos, maybe throwing the odd palm tree into the background. Thanks to discoveries like this, that lazy old image is just about dead. This guy is never, ever safe! This drawing is by Aliki Brandenburg, from the Macmillan reading textbook "Snails to Whales." It's not substantial enough for a Vintage Dinosaur Art post, but I thought it was worth posting. I like the fact that it's using the relatively obscure Scelidosaurus, which is one of the early members of the armored dinosaur branch. It's fun to imagine traveling back in time to visit ancient worlds, watch historical events unfold, contract now-defunct diseases. One of my top time travel destinations would be Chicago's Century of Progress exhibition. 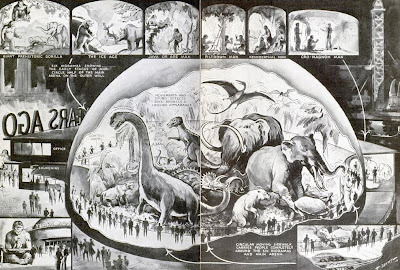 The June 1933 issue of Popular Mechanics includes a story about one of the exhibits at the Century of Progress: an enormous diorama depicting life through the ages called "World a Million Years Ago." It was designed and built by Messmore and Damon, a design firm who specialized in animated mechanical displays. Popular Mechanics featured this impressive two page spread, which I roughly stitched together. If you're interested in reading more about Messmore and Damon, make sure to visit this page at PopCult, which includes a company history and a very cool slideshow of some of their artwork, marketing materials, and design sketches. Modern Mechanix features a story from an old issue of Mechanix Illustrated, profiling Messmore. 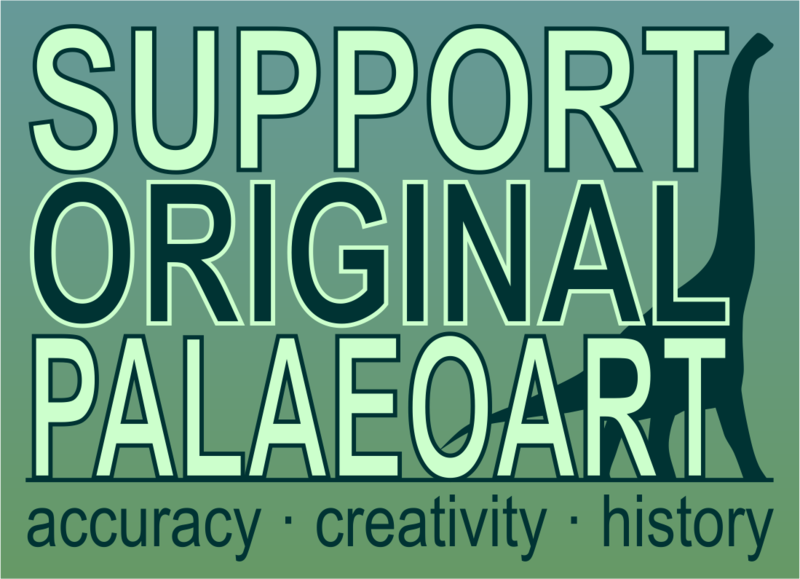 Every couple of months, the paleoart blog Art Evolved assembles new galleries dedicated to specific groups of dinosaurs. The latest deals with the therizinosaurs, one of the hippest groups of late. Really, very hot right now, though I could see the alvarezsaurs usurping their spot, becoming the Hannah Montana to their Lizzie McGuire. I'm not saying it's inevitable. The stature of dinosaur clans in the popular imagination is governed by a complex set of factors. Therizinosaurs certainly have the size advantage. But the alvarezsaurs have weirdness on their side. I'm not saying that alvarezsaurs are, in fact, weirder than therizinosaurs; it's just that weirdness fades over time and therizinosaurs have been better known for longer. And if some animated entertainment decides to create a cuddly Shuvuuia... all bets are off. Anyway, you ought to skip on over to the ol' Art Evolved. Brett Booth does a cool profile of Therizinosaurus, and Rachael Revelle does a very cool linoprint. And here is a teaser from the Hoosier state's own Matt Tames. Matt has done work for the Children's Museum of Indianapolis, which is without a doubt the coolest children's museum around. Proof? You want proof? Check this out. Bill Parker of Chinleana has posted my favorite April Fool's joke, ever. It almost got me - when I saw the post in Google Reader, I got excited. 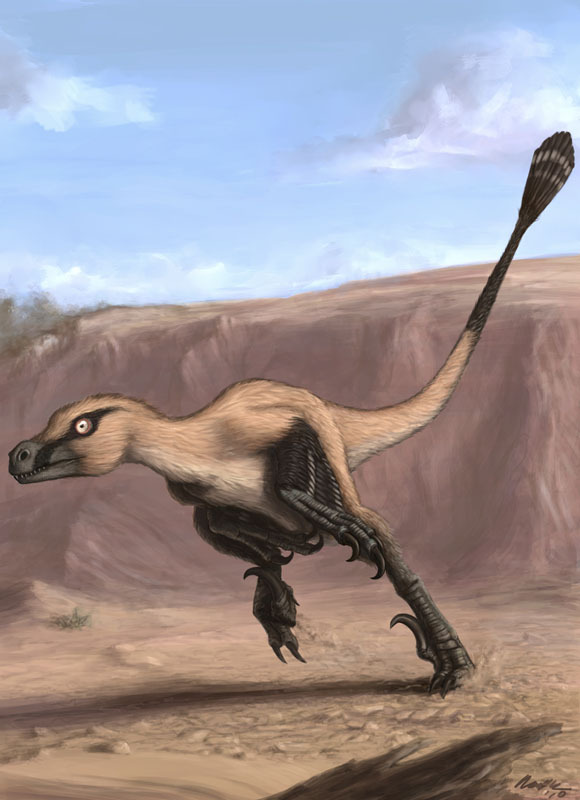 At first, all I saw was the name of the new dinosaur, Chinleraptor, which is an indisputably cool name for a dinosaur. Then I kept reading the abstract... all I can say is, "well played." I should have read the paper's title first. Howard, M., Howard, S., Fine, L., Howard, C., and J. DeRita. 2010. Chinleraptor dockumensis a megacooldudinid carnosaur (Family Dromaeosauridae) from the Late Triassic (Ungualia biozone) of Texas, the largest (and thus coolest) raptor ever. Upublishyerself 1:1-2.